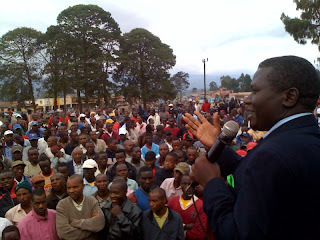 I am a healing President, Mao tells Kisoro Democratic Party Presidential candidate Norbert Mao has said Uganda is full of scars and wounds and therefore needs a healer who can mend the torn society. He pledged a transparent national reconciliation plan that will help Uganda rise above it's dark episodes. In reference to Museveni, Mao said any repentant person can be forgiven. He assured the residents of Kisoro that Museveni will not be persecuted. "I am not in this contest to witch hunt Museveni. I have no vendetta with Museveni. I am only in this contest because Uganda deserves better. When I defeat Museveni he can return to Rwakitura and tend to his cattle and look after his grandchildren", Mao said. He sent the gathering into prolonged laughter when he promised Museveni a send off gift of a fully equipped Recording Studio in order to help the President pursue his newly found musical talents. "We should not waste talent. In order to help President Museveni pursue his musical talents, I will offer him a send off gift of a fully equiped recording studio", Mao said as the crowd roared with laughter.